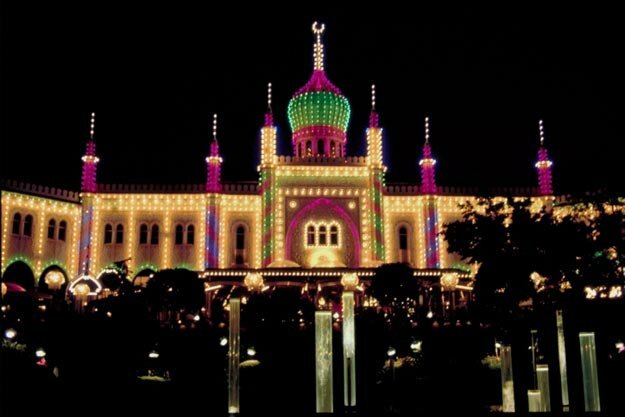 Tivoli Gardens is the most-visited theme park in Scandinavia, and the second-oldest operating amusement park. The amusement park features beautiful scenery, a lake and flower gardens. It originally had rides like a merry-go-round and a scenic railway. Today, the garden owns some of the best rides such as the wooden roller coaster (Rutschebanen), and Daemonen (the Demon). Tivoli Gardens is also home to the world’s tallest carousel, the Star Flyer. For kids the park has the Big Clock, Dragon Boats, Dyrekarussellen, the Fun House, the Light House, the Little Pilot, Nautilus, Petzi’s World, the Panda, Rasmus Klump, the Temple Tower, Trolley Bus and Vintage Cars. Other attractions at Tivoli Gardens include the pantomime theater, an open-air theater for performances in the commedia dell’arte style, as well as ballet and modern dance. Live music is featured during the summer months. Laser and water shows over the lake are held during the evenings. In 2013, Tivoli has expanded to create a new astronomy themed area named ‘The Cheerful Corner’. This place features three rides inspired by the 16th century Danish astronomer Tycho Brahe and are designed for all ages. Several restaurants at Tivoli offer lip-smacking food. Some of the delectable varieties include Steak and bearnaise, sushi and saké, pita and beer. Tivoli also offers accommodation facilities. Visitors can stay at the famous Nimb Hotel within Tivoli Gardens. Tivoli Gardens opened on August 15, 1843. Originally, the park was named ‘Tivoli and Vauxhall’. The park is illuminated at night by 111,000 custom-designed lights. More than 400,000 colorful flowers embellish the gardens. Situated right in the city center of Copenhagen, Denmark, Tivoli Gardens is not far from the central station. 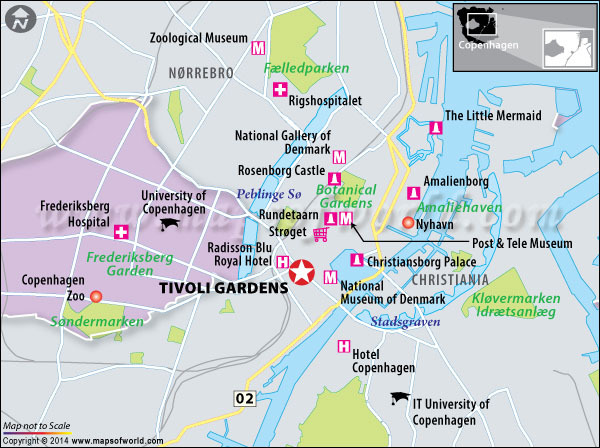 Copenhagen airport is just 20 minutes away from the Tivoli Gardens. As Tivoli Gardens is a popular destination, buses also frequently stop here. You can reach the gardens via bus, train or taxi. Though the holidays bring lovely lights and decorations and Christmas markets to Tivoli Gardens, both winter and autumn in Copenhagen have cold temperatures and short days. Summer months, from May to August are the best time to visit Tivoli Gardens because the days are warm and long. Spring can be unpredictable in the region, sometimes carrying winter weather long into the season, including snow and rain. The amusement park opens in three seasons viz. summer, Halloween and Christmas. The timings and the days of opening keep on changing. To find the latest information about opening hours visit the official website of Tivoli. For individual admission, the ticket costs £ 95.00 while group admission costs £ 90.00 per person. Children under eight years have free entry. The admission tickets do not include any of the amusement park rides. You can buy single or multi-ride tickets. The details of the packages can be found here. Nearby attractions: Danish National Gallery, Copenhagen Zoo, Rundetarn and Bakken.